So you’ve got a hold of your favorite standby stick. Or maybe somebody just gifted you a Padron, Opus, or Liga and you’re sitting there smacking your lips. However it came to you, are you going to get the most out of it? Read on and discover some easy additions that will elevate your smoking experience from caveman to aficionado in no time. It can be tempting to jump right in and set that foot afire. The workday is done, you’re in your favorite chair, the game is on, and you’ve got your drink of choice. But before you get into the feature film, why not see a preview? Many smokers know about this step, but when was the last time you remembered to do it? The method is, of course, as simple as you thought. After you cut the cap but before you light up, take a puff just like you normally would and hold it for a moment. It’s especially helpful to retrohale your cold draw, which is explained below. You’ll find that sometimes the things you taste will show up in your smoke, and sometimes not. Either way it adds to the mystery and allure of what goes into creating a premium, handmade cigar. It’s also great just to add a little ritual to your experience. It’s like taking a moment to clink your glasses when out with friends. It makes the experience just a little deeper, gives you just a little more to enjoy. Aside from getting a good light from the start, there are a few other things you can do to prevent or fix a cockeyed burn line. We’ve all experienced “canoeing” at one point or another, when one side burns faster than the other. Try spinning it so that the slow-burning side is on the bottom. While this may sound like voodoo, it has been proven in the field by many a smoking scientist. The theory is that the bottom is getting more oxygen because of the rising smoke, which causes it to burn faster. This is why some smokers make a habit of slowly rotating the cigar as they smoke. Another trick you can use, although slightly less cosmopolitan, is to use saliva to slow down the side that is burning too fast. Just put a dab right underneath the ash, which will cool it down and give the rest of the tobacco a chance to catch up. Just try not to get a long, unsightly string of spit from your mouth to the cigar; nothing kills a herf faster. Lastly, you can always touch it up with the lighter. Try to avoid putting the flame directly on the wrapper, opting instead to use the heat from the flame. Spin the cigar until you have a nice even burn again. Note: you made need to purge the cigar after touching it up. Read on to find out how. Perhaps you’ve heard other smokers talk about this and just nodded your head, not wanting to be found out. Then you ran home and Googled it and here you are. Retrohaling is just a fancy way of saying “push the smoke out through your nose.” It’s just like breathing out of your nose, but instead of air coming from your lungs it’s smoke coming from your mouth. If you feel like a kid again, trying to learn how to jump in the deep end of the pool without pinching your nose, then you’re not too far off. Just like you learned back then to close your sinus cavity, now you need to keep it open and push the smoke through it. The reason for retrohaling is simple. Your mouth can only detect five basic flavors: bitter, sweet, sour, salty, and umami(savory). Anything beyond these five is picked up by the nose. This is why you’ll hear smokers describing flavors such as “cream, black pepper, almonds, mint, bread, earth, chocolate, coffee, cherry, coconut, etc.” while others will protest that such proclamations are complete nonsense. The latter smokers either have not learned how to taste a cigar properly, or they’re smoking cheap (and sometimes not-so-cheap), flavorless tobacco. Incidentally, this is how you also taste food. It’s what scientists refer to as “retronasal smell,” small exhalations we make as we chew our food. If you haven’t tried it with cigars yet, you’re in for a real treat. Take caution though, as some cigars will be too spicy to do this right off the bat. You’ll have to wait for them to mellow out a bit, usually after about half an inch. Otherwise, your sinuses will cringe and your eyes will sweat like you’ve just diced 50 onions. One common thing I see with new smokers is they smoke too fast. They puff away as if it’s a race to the nub. This is the exact opposite of what you want to do. It’s best to keep the cherry as cool as possible. Once the tobacco heats up too much, you’ll get all kinds of nasty flavors that will overshadow everything else. The customary rule of thumb is to take 1-2 puffs per minute. If you are smoking too much, too fast, there’s a good chance that you aren’t giving that delicate tobacco enough attention. Take a draw and savor it. Remember, smoking is about slowing down and enjoying each moment, not burning through them. 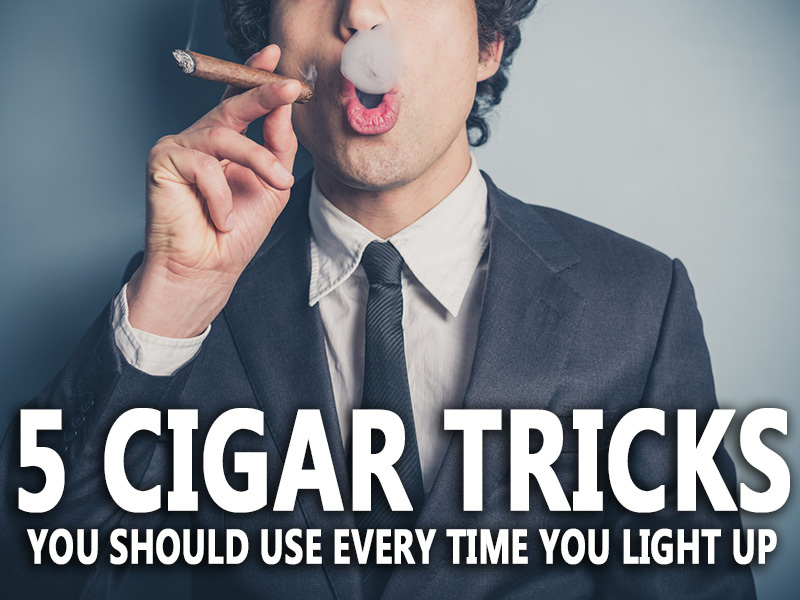 Give these tricks a shot over the course of your next few smokes. Soon enough they’ll become second nature and you’ll be on your way to flavor heaven.